Pasta and Chickpeas with four different veggies for goodness. 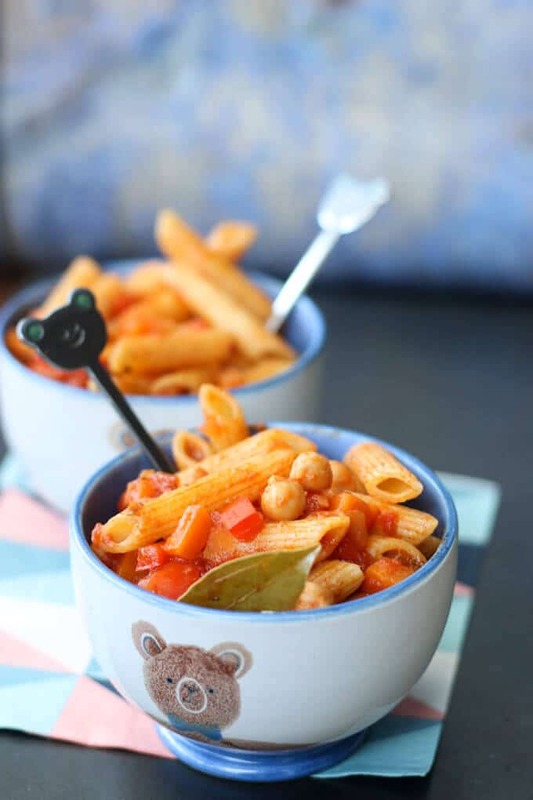 Pasta and Chickpeas with four different veggies / fruit. Leave the sauce chunky or hide the veggies by pureeing. Finn would live on pasta if given the choice. He constantly asks for it and I’m always trying to think of healthy sauces to pair with it. 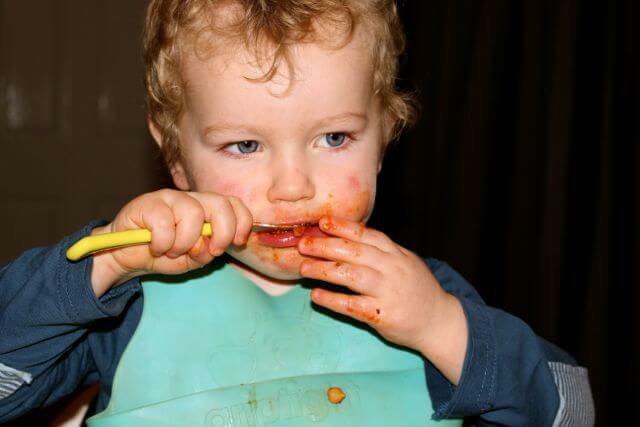 Tonight we had pasta and chickpeas. The sauce was made with chickpeas (a high fibre food source rich in vitamins and minerals), carrots, peppers and tomatoes. Combined, it made a delicious yet healthy sauce to accompany any type of pasta. I cut the vegetables into small chunks as Finn is happy to eat it that way. If you have a fussy eater, who doesn’t like to see the veggies then you may wish to grate the carrots / onion or puree to a smooth sauce before adding the chickpeas. If you have a pasta lover too then why not try my tuna pasta recipe or this avocado spinach spaghetti. 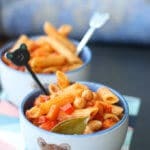 Pasta served with a healthy chickpea and vegetable sauce. Heat the oil in a saucepan and add the onion, carrots and garlic. Fry on a medium heat until the onion starts to become translucent. Add the pepper and herbs and fry for another minute. Meanwhile cook pasta (of your choice) according to pack instructions. *If you want a smooth sauce, with the veggies hidden, then simmer without the chickpeas then blend and add the chickpeas. Great recipe Amy, my little one loved it. Does the chickpea and vegetable sauce freeze?